KILIMANJARO CLIMBING PRICES: WHY SUCH A DIFFERENCE? We live and climb in a competitive world. You can attempt to summit Kilimanjaro with a local Tanzania or Kenyan company for as little as $1,200. You can pay over $6,000 trekking with the heavily advertised international companies or you can climb with Tusker on comparable routes and pay between $3,800 to $5,700. Over 100 companies are competing on the mountain and the price range is as varied as Kilimanjaro’s terrain. Climbing Kilimanjaro is a life-or-death deal, so are you going to risk it all for the lowest price with a Kilimanjaro cowboy outfit? It’s a very important decision only you can make. Almost every day freelance porters line up at the entrance to the park hoping to hook on with a trek. Low budget companies hire them and often pay them below the minimum $7 a day wage that the national park has set. Some companies don’t pay porters anything and make them depend on tips. Some porters are not in tents and hike in tattered clothing. And most of the deaths on the mountain are badly cared for porters. Kilimanjaro’s cut throat price war is often hardest on porters, and if you don’t want them on your conscience you don’t book the $1,200 trip. The national park fees charged to the trekking companies alone are $100 a day per climber so how can a company charge $1200 for a climb that lasts a minimum of 5 days? By ripping off their porters and compromising on food, equipment and crew. Your chances of summiting are very low. The low budget five day climb summit success rate is around 25 percent, according to Kilimanjaro National Park statistics. But if something goes badly wrong on a cheapo climb that has no medical back-up, you become a statistic. The top echelon companies that charge the highest rates all put their clients up at the best local hotels before and after the climb. On the mountain they provide quality food, equipment and guides, but there are differences between them and sometimes you don’t get the most bang for your buck. The largest international travel companies have huge overheads and their high costs are reflected in their Kilimanjaro prices. Kilimanjaro is an international icon but it’s also a cash cow. They try to leverage their established names charging top dollar. 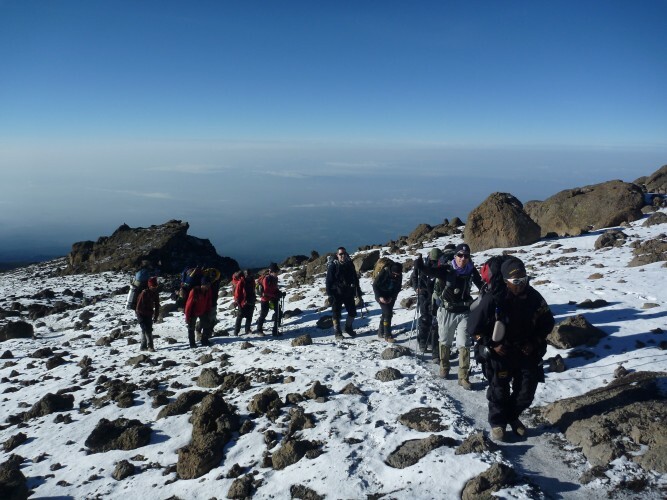 “Tusker Kilimanjaro climbs have experience, leadership and safety, longer times to acclimatize on the mountain than most tour operators that I found, and are anywhere from $2,000.00 to $4,000.00 less expensive than the company I climbed with, particularly when you factor in 12 to 14 days on the mountain vs 10 days for acclimatization. My experience with the company I chose was excellent, but the experience and training of Tusker and their professional porters, guides, camps, and PRICE will make it a choice of guides for me for several other adventures and goals I have planned.” Read the TripAdvisor article here. Some people prefer paying the most for everything. It gives them a sense of quality and feeds a sense of entitlement. If you’ve got the dough that’s the easiest choice, but sometimes the best deal isn’t the lowest or the highest price. To find the right price on Kilimanjaro you’ve got to do your homework. Consider the company’s experience and how they train their guides and chefs. Will your guides monitor your health and keep you safe? Will your tent keep you warm and dry at night? Ask a lot of questions beginning with — what is your summit success rate? Tusker’s rate is over 98 percent on our longer routes. So start your research. We’re confident you’ll find Tusker to be the best value on the mountain.